Perfect for Camping, Disaster Relief or Home. Comfort and Survival Means Staying Warm & Dry! In the chaos of an emergency or disaster, getting a few minutes sleep can mean all the difference. 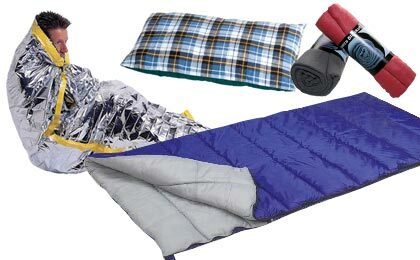 Our emergency sleeping supplies are warm, durable and ready to give you and your family comfort when they need it most. Waterproof Thermal Tarp Shelter Kit with Stakes and Paracords - 58" x 77"